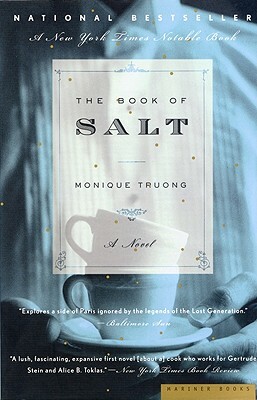 The Book of Salt serves up a wholly original take on Paris in the 1930s through the eyes of Binh, the Vietnamese cook employed by Gertrude Stein and Alice B. Toklas. Viewing his famous mesdames and their entourage from the kitchen of their rue de Fleurus home, Binh observes their domestic entanglements while seeking his own place in the world. In a mesmerizing tale of yearning and betrayal, Monique Truong explores Paris from the salons of its artists to the dark nightlife of its outsiders and exiles. She takes us back to Binh's youthful servitude in Saigon under colonial rule, to his life as a galley hand at sea, to his brief, fateful encounters in Paris with Paul Robeson and the young Ho Chi Minh.